There’s an end to everything.Will the end becomes an ultimate one, or it’s just an excuse for something new to start? Is the new thing going to be better or worse; or the worst thing of all, will it give the ultimate ending? Se-kwang stares at Cha-don, who’s in the awkward position of being hugged by Madam Park. She’s dragged away back to her cell as she calls out his son’s name and Cha-don sends her away with a pitiful glance. Cha-don then talks about the parole case with Se-kwang and Se-kwang shows that he feels disappointed as he failed to protect Madam Park back then. He asks about what Kang-seok was like and Cha-don now wants to find Kang-seok, although others think that he’s already dead. Ji-hoo and Jae-in are together and they’re about to practice the scene for the trial, but Jae-in keeps thinking about Cha-don. She even answers the door without checking but it’s Cha-don, coming back from the prison. Ji-hoo decides to return to the office but she tells him to stay there to protect Jae-in, should anything happens to her. Both Cha-don and Jae-in aren’t that happy to be together. He’s complaining that only a small carton of milk is left in the fridge and offers it to Jae-in, but she warns him not to shove any food in her face. She goes straight to bed while Cha-don is still awake. Later, while Jae-in is sleeping, Cha-don wakes up from his sleep and walks slowly towards the bed. He’s enticed by Jae-in’s legs and approaches her, holding out his hands to touch her. Jae-in wakes up and waits until he’s close enough to surprise him, and she screams. It turns out that she’s just dreaming and chides herself. Suddenly, Cha-don really wakes up and Jae-in returns to her sleeping position. He walks slowly towards the bed and approaches her, holding out his hands. She screams and surprises Cha-don, who wakes up to drink the milk. She feels bad that he’s more interested in the milk rather than her. 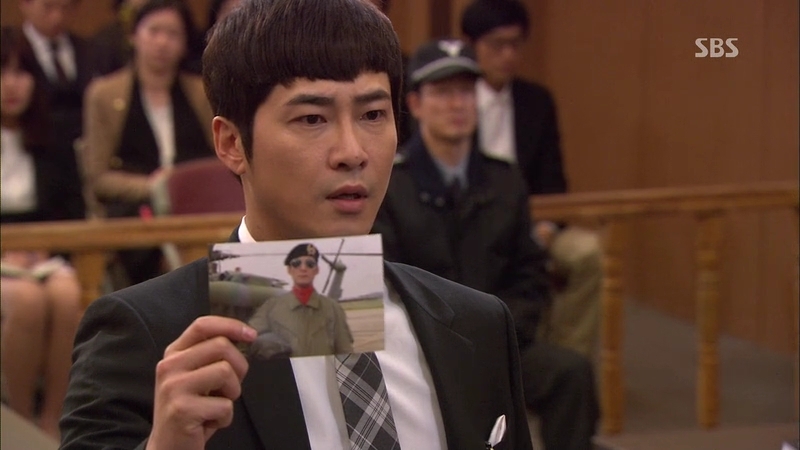 Mayor Jung is told that he shouldn’t attend the trial for Mr Lee but he still insists on going. The prosecution team is still waiting for Jae-in to finish her make up as Ji-hoo warns Cha-don not to be nervous on his first trial. Officer Yang is already planning for their meal afterwards but Jae-in warns him not to talk about of food in front of her. They are surrounded by reporters once they arrive at the court and Ji-hoo has to drag Cha-don away from them. They meet Mayor Jung at the entrance as Se-kwang’s team is being the spectator of the scene. Mr Lee hands a paper to Attorney Hwang and tells him to ask the questions according to what written on the paper. The trial starts with the first witness, Jae-in. She’s a little nervous but manages to answer the questions from Ji-hoo about her being kidnapped by Mr Lee. However, Attorney Hwang points out her real name and hints that she’s capable of lying. Next, Ji-hoo starts questioning Mr Lee about the fountain pen. She wants to use the DNA as the way to confirm that he’s the murderer, but Attorney Hwang thinks that it’s like concluding the suspect as guilty even before the verdict is given by the judge. Hence, they decide to go with the blood test and Mr Lee’s blood type is proven to be B, different from the blood found on the pen, which is type A. The real pen was already taken by Prof Kwon, who got rid of the crucial evidence in order for Se-kwang’s investigation not to be hindered by the murder case. Ji-hoo asks for more time, but the judge only gives them time until the afternoon session, which will start at 3 PM. Mr Lee actually formed alliance with Se-kwang way and the questioning was already planned beforehand. Chief Jo is mad that the prosecution team for almost losing and wants them to give up on the case, but Ji-hoo refuses to do so. Cha-don takes the blame on behalf of Ji-hoo and she’s not that pleased about it but she still believe that the evidence is hiding somewhere. Both Mayor Jung and Se-kwang’s teams are having their early lunch celebration over at Madam Bok’s restaurant. Madam Bok knows everything, but chooses not to meddle in the matter. Cha-don is still looking at the details to point out any possible evidence during the lunch and he can’t find any possibility of Mr Lee covering a long distance in such a short time. Jae-in is drooling over the jajangmyun and starts digging in as Cha-don is frustrated with the lack of evidence on their side. Jae-in hints about having some sort of Batman car will make it possible to move from one place to another in a short time. A picture of Mr Lee with a helicopter gives him an idea about the possible alibi that Se-kwang talked about with Mr Lee before. He gets a clue and asks Jae-in if she heard anything on the day of the incident but she’s too busy crying for eating the whole portion of jajangmyun. He drags her somewhere and they start looking for a high rise building. 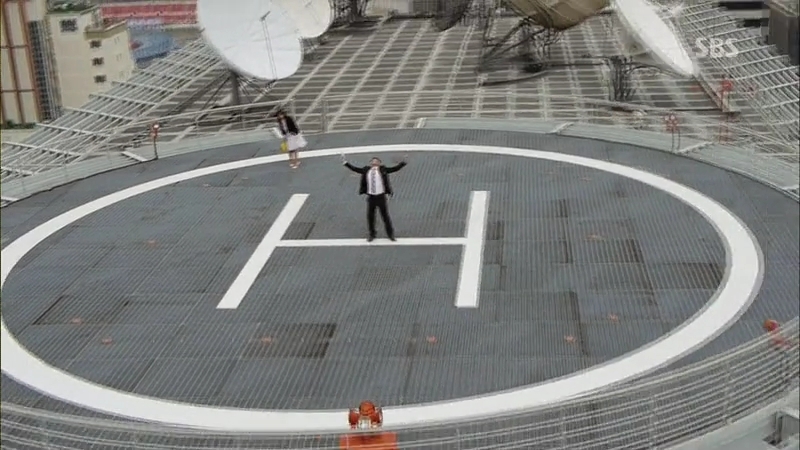 They go up to the top of the building and a helipad is there on the building. Cha-don finally connects the dots and screams in victory for finding the ultimate evidence for the case. He hugs Jae-in and spins her around. She thinks that he’s leaning in for a kiss, but he’s too immersed in the case and realizes that they’re running out if time. Ji-hoo gets to know that the person she gave the pen to have disappeared and asks the person-in-charge for DNA profiling to help her. 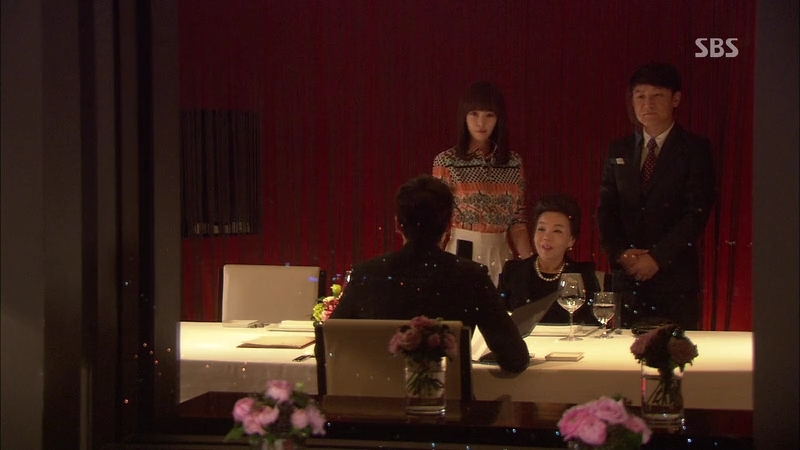 At the same time, Se-kwang runs into Mayor Jung when they’re about to leave the restaurant. Se-kwang is confident that he will be able to send Mayor Jung to the prison and shows no respect to him. The afternoon session is starting and Officer Yang receives a call from Cha-don to ask for his help. Cha-don is racing against time, riding a pizza delivery bike with the screaming Jae-in. Se-kwang overhears Officer Yang’s conversation and follows after him. Ji-hoo manages to prove that the real fountain pen was replaced with other pen, which is confirmed by the DNA profiler. However, she can’t present anything to prove that Mr Lee’s alibi is invalid. Cha-don reaches the court but he’s blocked by Se-kwang, who wants to have a talk with him. Se-kwang wants him to give up on the case as he won’t be able to catch the top man in the crime if Cha-don makes Mr Lee guilty of the murder, but Cha-don refuses to do so. Se-kwang gives him an opportunity to make him a great prosecutor under him but Cha-don won’t budge from his decision. The court almost comes with the conclusion since Ji-hoo can’t provide any evidence to oppose the alibi, but Cha-don comes in with the evidence. Ji-hoo passes the stage to Cha-don to start explaining the evidence and he’s so nervous since this is his first time acting as a real prosecutor. The people in the public gallery laugh when he keeps making mistakes but Cha-don soon regain his confidence and starts to present the evidence that he have obtained. Mr Lee is capable of handling a helicopter and used one to go to Seoul to kill the victim before returning to his alibi place in Incheon in an hour. Hence, the court gives a sentence of 15 years in prison to Mr Lee and Cha-don cannot contain his happiness, hugging Ji-hoo in the midst of his celebration. Mayor Jung looks disappointed and also Se-kwang, who leaves the court to vent out his anger alone. Mayor Jung gets interviewed by the reporters and shows disappointment that the murderer is his person. He offers his apology to the whole nation in front of the reporter. The prosecution team gets together for a victory dinner along with Jae-in, who refuses to drink the wine because of the calories. However, she’s jealous of Cha-don and Ji-hoo and proceeds to stop their love shot with a ‘Cheers!’ for all of them. Meanwhile, Prof Kwon tells Se-kwang about the last resort in Mayor Jung’s case, which is to use Eun Bi-ryung. Reporter Go joins them and gives the evidence about Mayor Jung’s involvement with a business in Las Vegas, together with Bi-ryung. Bi-ryung gets a call from Se-kwang and acts like she doesn’t care about him. He invites her to come to his house and disconnects the call. It’s bad news for Cha-don, as Ji-hoo and Jae-in are both drunk and start crying over the meal. Jae-in is complaining about her diet and both of them shove food into each other’s mouths. Cha-don decides it’s better not to meddle in the drunken women’s business and leaves the place. Although she’s late, Bi-ryung still goes to Se-kwang’s place. He tells her about the evidence about her involvement with Mayor Jung’s money and she thinks that he’s going to bring her down, but he wants to start again with her. He manages to trick her into believing him again. Cha-don goes to meet Madam Park and breaks the news that her parole appeal has been granted. He gives her the address to the orphanage he used to stay at and tells her to go there since he already told the orphanage’s director about him. Officer Yang tells Cha-don that Mayor Jung has been arrested and it turns out that Bi-ryung has already joined Se-kwang’s team to bring down Mayor Jung. Cha-don attends his appointment ceremony as a prosecutor and Ji-hoo comes to congratulate him along with Officer Yang. They are planning to go for a drink, but Cha-don suddenly receives a call from the orphanage director. His benefactor, the Gentleman of Jingogae has decided to meet him. He goes to the place and feels nervous to meet the most important person in his life. A look at the woman and he recognizes Madam Bok. She introduces herself as the Gentleman of Jingogae. Madam Bok gives the statement about the money she has spent in order for him to become a full-fledge prosecutor. He doesn’t want to believe that such a large sum of money has been spent by him but the surprise doesn’t stop there. Someone knocks on the door and enters Jae-in to join them. Madam Bok introduces Jae-in to him and he recognizes her: the Piggy Princess from the past. At last, the meeting between the Piggy Princess and the Good-looking Dumb! I thought they’re going to hold the truth about Jae-in’s identity from Cha-don for a longer time, but they decide to just tell him about it. I can’t predict what will happen since there’s no preview (WHY??!) and the things I’m sure about are: 1) The bad guys and girl are together again, thus the good guy really needs some back up, and 2) Jae-in still likes Cha-don, although he only ignores her all the time. I think it’s only a matter of time until Attorney Hwang joins Se-kwang and Co., since he won’t have the backing from Mayor Jung anymore. It’ll be impossible for him to come against Se-kwang and it’ll be wise for him to be on his side. And their target will probably be Madam Park. Now I’m worried about her because she’s alone. Jae-in wants to be acknowledged by Cha-don for her beauty but all her cares about his case and probably a bit about her plastic surgery. Hehehe. I must say that his acknowledgement is the thing she needs most from Cha-don, as he was the first to insult her openly about her physique while she’s head over heels for him. Plus, it happened twice in her life! It might be something small, but there’s a pride she’s holding onto and she needs him to acknowledge her. However, it won’t be that simple as she’s probably be the one who will surrender first. thank you for doing the recaps. enjoyed them! keep them coming! Thanks a lot for the recap. While i cannot view the drama itself (blame on the busy schedules), i eagerly wait for the summaries. This drama is very good. I love KJH – loved ever since i discovered him in Lie to Me.